We’re happy to announce that September’s Mondays at Monarch reading will be a new play in it’s second iteration by Nilsa Reyna. Nilsa worked an earlier draft of this play with Monarch Theater earlier this year and is joining us again with a fresh draft – more information to come! To submit a play to our Mondays at Monarch reading series, please email the play, a synopsis and your bio to info@monarchtheater.org. One playwright will be selected monthly and provided with actors, a director and a space for the developmental reading, and given feedback from the Monarch staff. We look forward to reading your plays! Check out our new NEWS AND MEDIA page for all info on These Troubled Times while it’s in Edinburgh! You’ll find all the info on the cast, the crew and how to get in touch if you loved the show – check it out! These Troubled Times in Edinuburgh! THESE TROUBLED TIMES will officially open as part of the Edinburgh Fringe Festival at C Venues on Wednesday, August 5th! August 5-22 at 15:45 (3:45 PM) 50 min. These Troubled Times opens at 59E59th St. next week as part of the East to Edinburgh Festival before heading off to Edinburgh, Scotland, for our month-long run at C Venues as part of the Edinburgh Festival Fringe. Check out our showtimes below, we hope to see you at one of the shows! These Troubled Times on the C Venues Website! For tickets and more information about These Troubled Times at the Edinburgh Fringe Festival this summer, check out the C Venues website at cthefestival.com and information specific to These Troubled Times can be found at https://tickets.edfringe.com/whats-on/these-troubled-times#book! 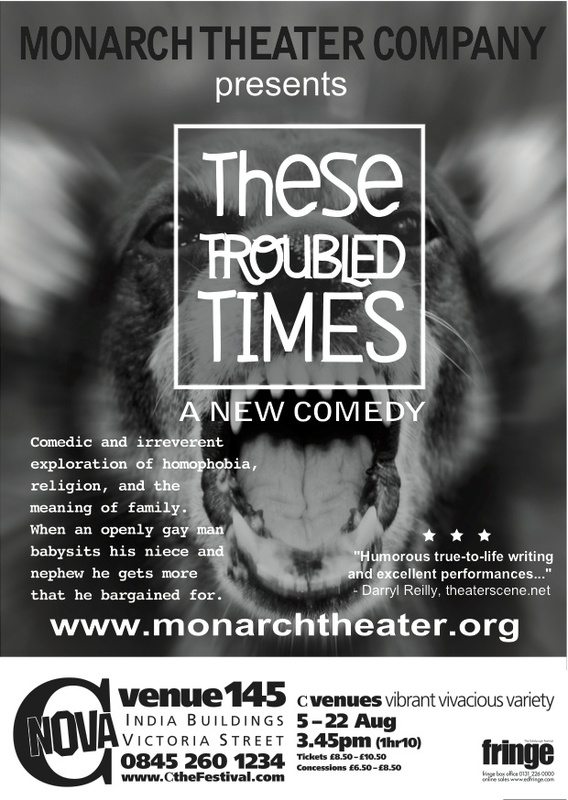 Monarch Theater, Jennifer Ortega and Troy Diana are hosting a benefit par-tay for their play THESE TROUBLED TIMES, performing this summer at 59E59th and C Venue in Edinburgh, Scotland, August 5-22, 2015. DJ Curtis Curtis, open bar and food! Festive Attire or Drag! Spectacular Prize for Best Dressed! 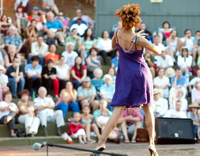 Get your tickets – we hope to see you there! Our Mondays at Monarch program will continue this spring with updated readings from playwrights Diana Marie Delgado and Nilsa Reyna. A new piece by Ms. Delgado will be read Monday, May 18th. The Care I Need by Nilsa Reyna will be read Monday, June 1st. 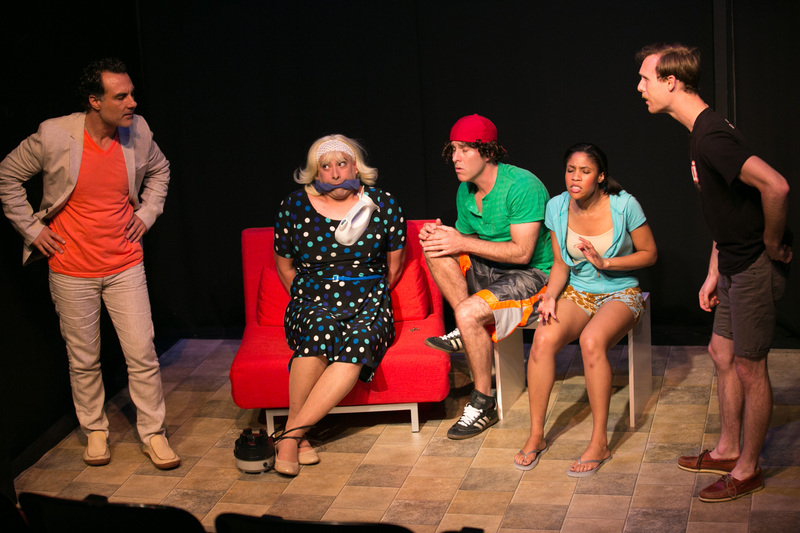 Troy Diana’s play These Troubled Times has come to a close and we are so thrilled to report that we raised over $3,000 thanks to some very special people. Our Indie GoGo Campaign has LAUNCHED! 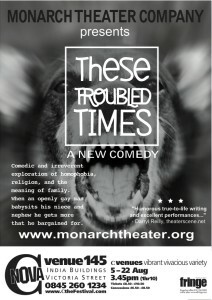 Monarch Theater NYC is headed to Edinburgh, Scotland, this summer with Troy Diana’s play These Troubled Times. We’ve launched our Indie GoGo campaign and one of the play’s characters, Mrs. Raymond, has a very important message for all of you. Click here for Mrs. Raymond’s message- Donate what you can to help us get this very important play to an international audience! 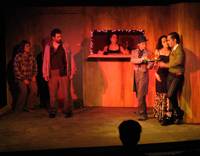 These Troubled Times Goes to Edinburgh! We have some exciting news to kick off 2015 – we’re taking Troy Diana’s end-of-the-world comedy These Troubled Times to the Edinburgh Fringe Festival! In the upcoming months we’ll be launching our Indie GoGo campaign featuring Troy himself as the God-fearing Mrs. Raymond, as well as making exciting cast announcements. We’ll be keeping you updated via Facebook, so be sure to “like” our Facebook page if you haven’t already – more info to come! If you like to donate to the theater to enable us to produce more ground-breaking work , please follow these steps: Monarch Theater is under the fiscal sponsorship of Fractured Atlas 501(c)3 not-for-profit organization.